Polls open 7 a.m. – 7 p.m. today. On Primary Tuesday, registered voters must vote in their assigned precincts, usually in their neighborhood and zip code. To vote, bring photo ID, list of candidates on paper or marked on a sample ballot to precinct in your zip code. Personal electronic devices are not allowed inside polling places during the March 6, 2018 Primary. New I-Pad technology will be used to check-in registered voters in Harris County on Primary Day. To find out where you’re assigned to vote today in Harris County, visit http://www.harrisvotes.com. 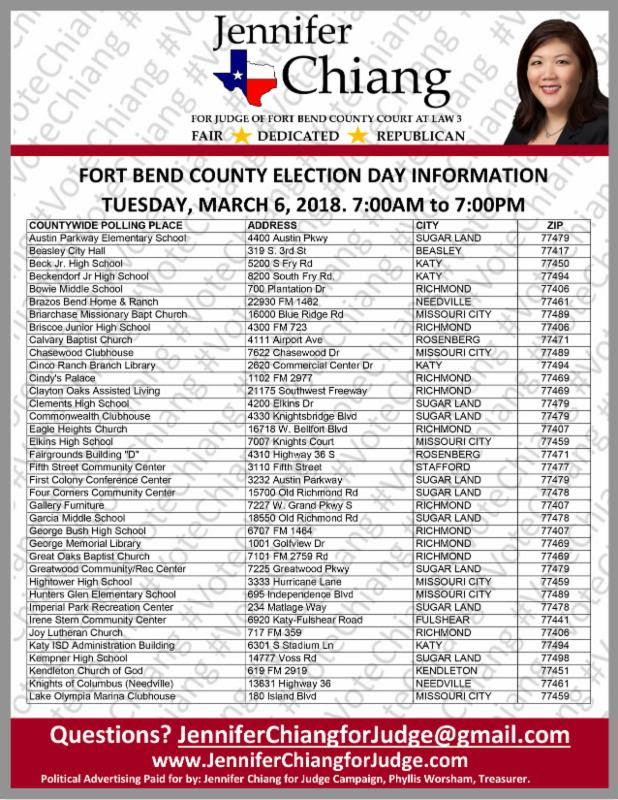 Below are 37 voting places in Fort Bend County, Texas provided by Republican Judge Candidate, Jennifer Chiang. Fort Bend County includes Katy, Missouri City, Stafford, Sugarland, Richmond, Rosenberg, Beasley, Needville and Kendleton. This entry was posted in Asian Community, Asian Community Houston, Community Alert, Elections and Politics, Fort Bend County News and tagged 2018 Texas Primary, Fort Bend Votes, Harris County March 6 Primary, Jennifer Chiang, March 6 2018 Texas Primary. Bookmark the permalink.